Sculptural Jewelry - This is a handcrafted textured three-dimensional sterling silver pendant that features an oval Lab created purple Alexandrite gemstone. This One-of-a-Kind statement necklace comes with a 24" handmade sterling silver link chain. 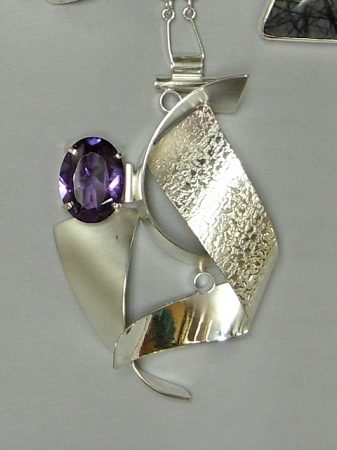 Handcrafted pendant created from large curves of textured and polished sterling silver accented by an oval faceted lab created alexandrite stone, which does change colors from pink to purple in different types of light. This beautiful pendant hangs from a handmade sterling silver adjustable chain. This piece has a wonderful contrast between the texture and shiny silver. Signed by Aaron and made by Modern Art Jewelry.